One sure-fire way to speed up your Internet connection is to replace your ISP's slow DNS server with a third party DNS resolver like OpenDNS. Considered by many as one of the best DNS resolution services, OpenDNS is free and is really very easy to set up. If you want further explanation about OpenDNS or if you are still not convinced to use it, perhaps you should go HERE first. 1. 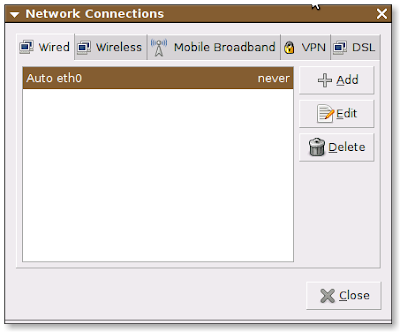 Right-click on ‘Network Icon’ (located at top-right panel by default) and click on ‘Edit Connections’ to open Network Connections Manager. 2. Choose the type of connection you have. For this example, we will use ‘Wired’. 3. Under ‘Wired’, highlight ‘Auto etho’ and click on ‘Edit’. 4. 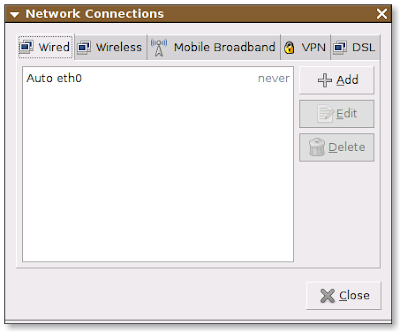 Inside 'Editing Auto etho' window, click on ‘IPv4 Settings’ tab. 5. 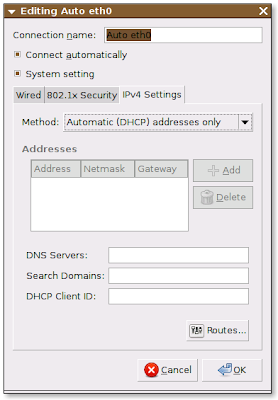 Under ‘IPv4 Settings’, change the ‘Method’ to Automatic (DHCP) addresses only. 7. Click ‘OK’ and you are done setting OpenDNS on Ubuntu. Everybody should think twice about whom to trust to answer DNS queries. Keep in mind that whoever controls DNS answers, controls which server will actually be contacted by an application. And since every company is required in the end to earn some money, one should carefully think about their business model and what they might be required to do tomorrow to stay in business. run your own caching DNS with Open Source software. Then you won't be hijacked with every search you make. It's ok to set your nameservers in /etc/resolv.conf. 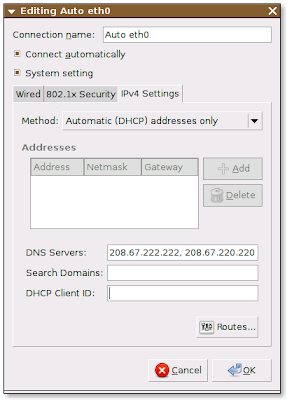 But you should stop using network-manager or set your IP to static as network-manager will grab the nameserver from DHCP and set the nameserver entry in /etc/resolv.conf overwriting your manual entry. Or use a better network management tool, wicd.